We are experiencing some winter weather in Virginia this week. Saturday evening, we had a little snow. Yesterday and today are very cold, never getting higher than the low 20s. The wind was blowing all day yesterday with gusts above 60 mph. Brrrr. This evening, we are expecting up to 8 inches of snow. It will look beautiful outside my window tomorrow, even if we get half of what is predicted. In anticipation, I have two cameras ready to capture it in time-lapse video (from home, a good place to be). It should be good practice of another element of photography. The cold winter weather and snow reminded me of one of my favorite winter images (above), shot a few of years ago. 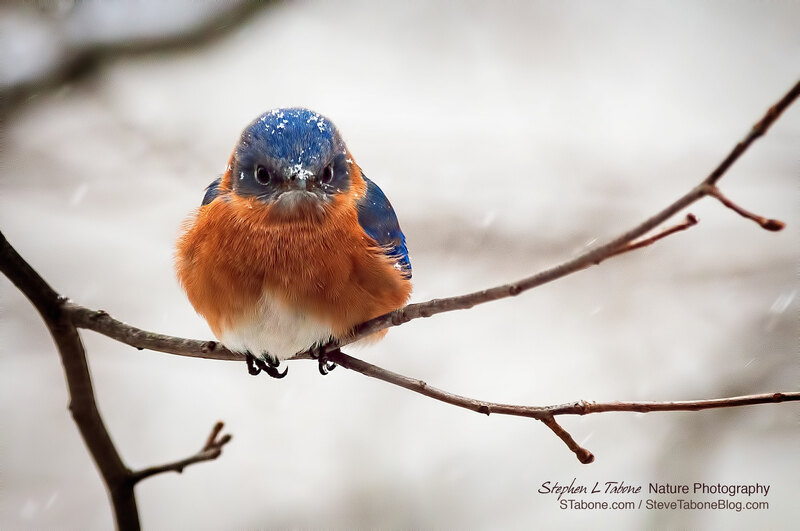 The snow covered, male Bluebird looked cold and angry. The bird’s head-on stare, irritated expression and the dusting of snow flakes made the image special. The next day, I was able to photograph the Bluebird again, but this time on a snow covered limb (below). He hammed it up for me again. Both of the images were photographed with a Nikon D300 and 80-400mm lens. One of the things I love about photography is being able to see and enjoy someone or something that would only be a memory. Memories are wonderful, but when accompanied by a good photograph, the memory and experience is better remembered and seen in your mind’s eye. Photographs also capture a moment in time and provide a slice of the ever changing detail that otherwise may have been missed. My image of the angry Bluebird is a good example. I would have missed seeing the Bluebird’s frown, if I had not captured it in my camera. Another appreciated benefit of photography is being to share what I see with others. I hope you enjoy these images as much as I do. 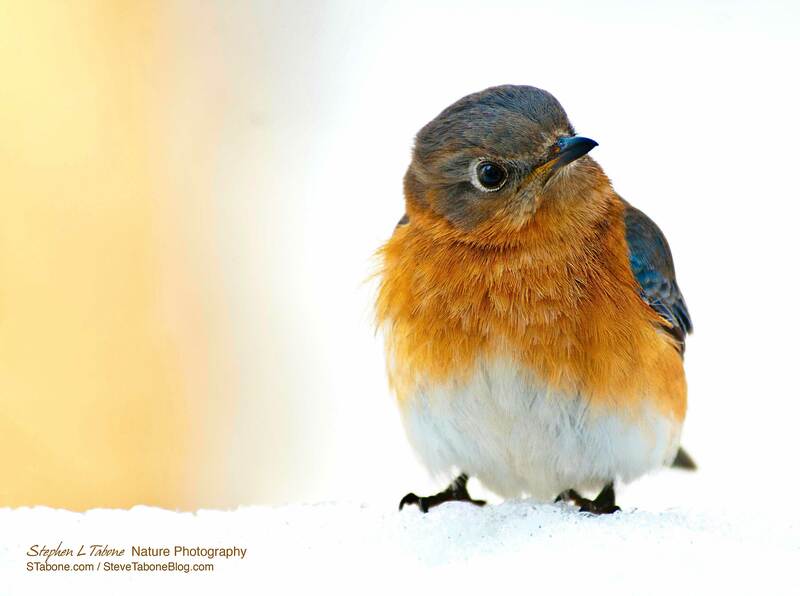 This entry was posted in Bird Photographs, Nature, Wildlife and tagged bluebird. Bookmark the permalink. Great capture! I look forward to when those cute bluebirds head up north. He was probably saying to himself I left the midwest to get away from this stuff! As you know, the top image has been one of my favorites of your images. I was just reading that one of the keys to great wildlife photography is to capture emotion. Your bluebird is a perfect example. That bird could not have expressed his feelings for the weather any better. Thanks for refreshing my memory of one of your best! Thank you Ernie. I can always count on you to send well written, thoughtful comments. Priceless! A reflection of my own disgruntled attitude toward the unrelenting cold temperatures and snow experienced here in the Virginia Shenandoah Valley. That little Bluebird is one of my favorites. I love his frown! That is exactly how I feel about this winter! Hope you capture the beauty of winter with your video because right now all I see are icy, dangerous roads and piles of dirty snow. Where is Spring?! Yup! Biggest snowstorm in DC area so far!? Looking forward your time-lapse shots, Steve. Hi Steve you are so good at capturing real life! I always like looking at your pictures. Very cute Bluebird! Thank you Yevette! Great to hear from you. Hello Steve – I was privileged to get this photo as part of a calendar you gave us several years ago and once the year was over I hated to throw this picture away so I framed it! And now the angry bluebird picture hangs on the wall of my den to remind me why I live in Florida – haha! So cute and lots of personality! Great photos, Stephen!